“No matter, how many valuation measures I use, the message remains the same. From current valuation levels, the expected rate of return for investors over the next decade will be low. In the short-term, a period of one year or less, political, fundamental, and economic data has very little impact on the market. This is especially the case in a late-stage bull market advance, such as we are currently experiencing, where the momentum chase has exceeded the grasp of the risk being undertaken by unwitting investors. However, over the long-term, it is fundamentals which matter the most. 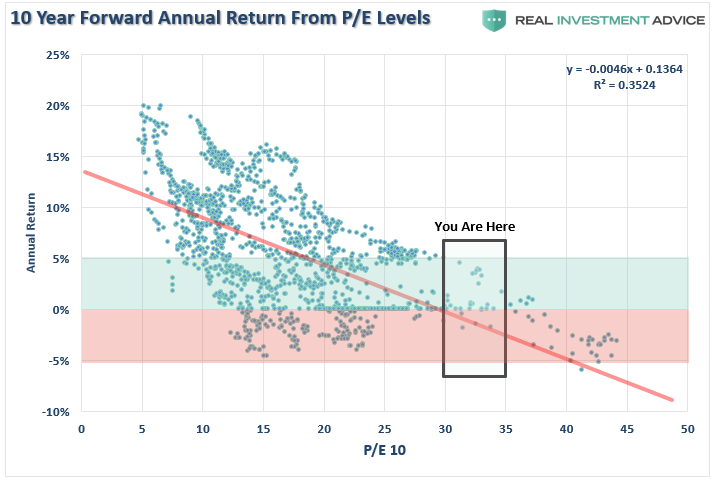 I have shown you the following chart many times before which is simply a comparison of 10-year forward total real returns from every previous P/E ratio. It was the same in 2000 and 2007 when the “bull market psychology” makes such antiquated ideas like “value” seem irrelevant. 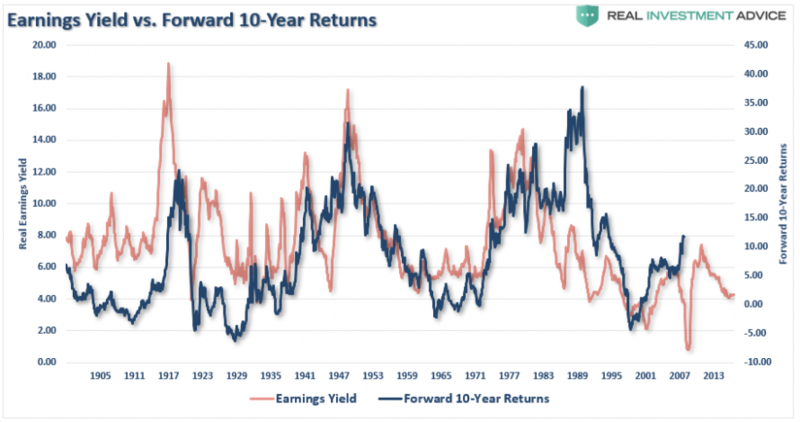 The important point to understand is that over the long-term investing period “value” and “returns” are both inextricably linked and diametrically opposed. 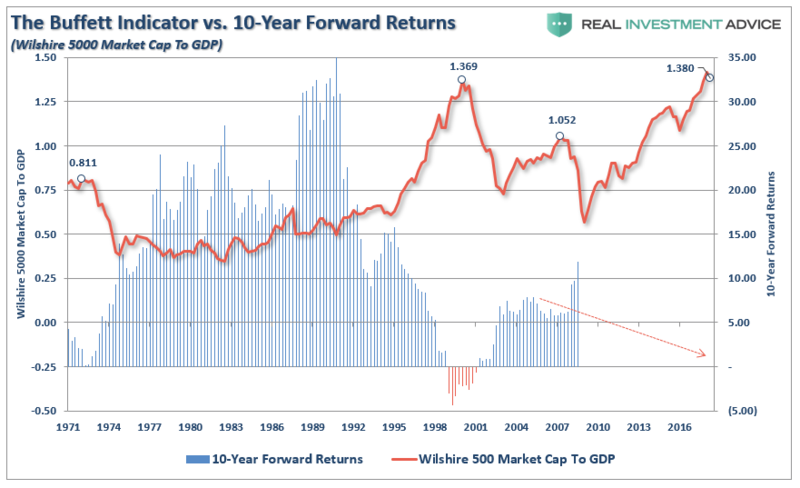 And, as shown above, given current valuation levels, forward returns are expected to be lower than the long-term average. 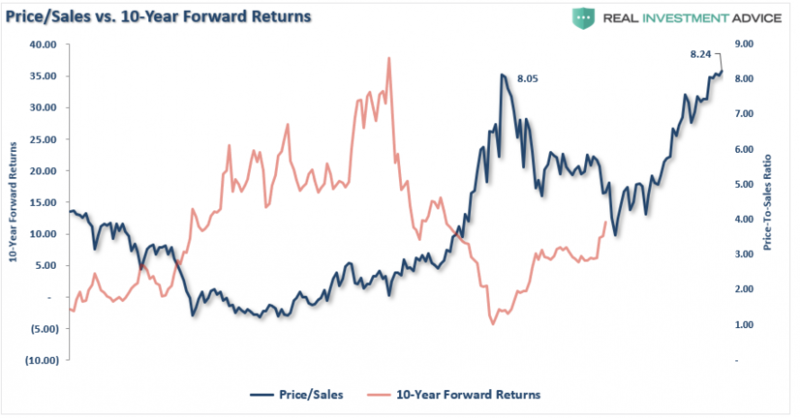 Before we look at different valuation measures, let’s review what “low forward returns” does and does not mean. This isn’t a prediction, it is just statistical probability and simple math. 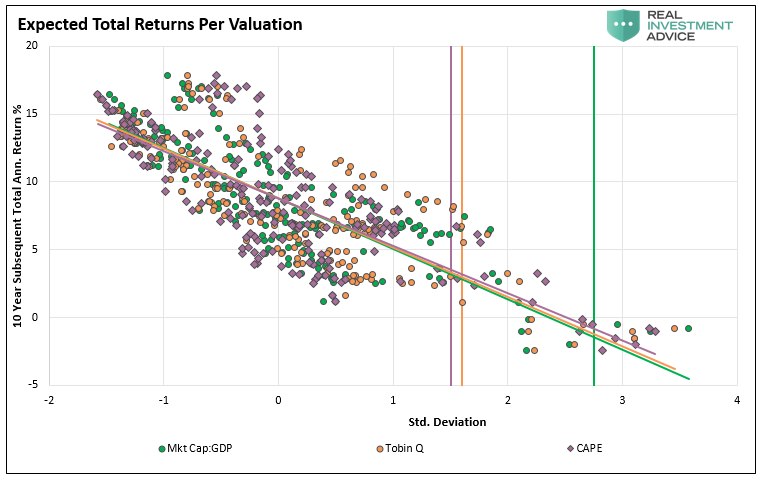 With the premise in mind, let’s take a look at a variety of valuation measures as compared to forward 10-year returns. Do Valuations Still Matter OR Is This Time Really Different? Tobin’s Q-ratio measures the market value of a company’s assets divided by its replacement costs. The higher the ratio, the higher the cost resulting in lower returns going forward. 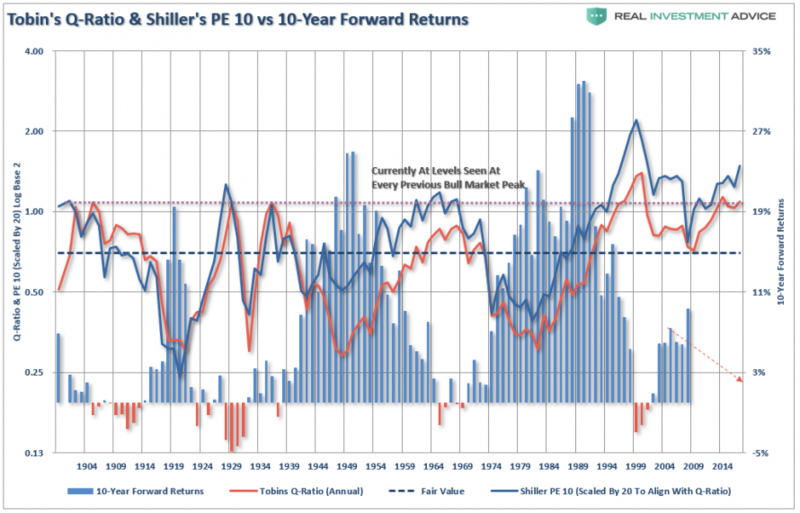 Just as a comparison, I have added Shiller’s CAPE-10. Not surprisingly the two measures not only have an extremely high correlation, but the return outcome remains the same. One of the arguments has been that higher valuations are acceptable because interest rates have been so low. 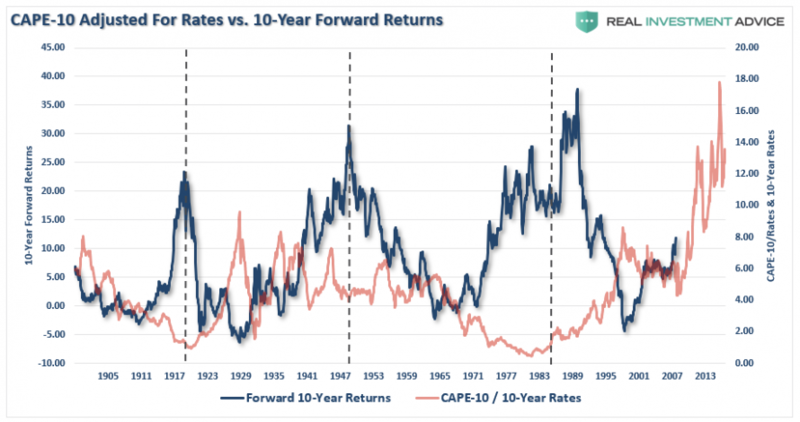 As we can see below, when we take the smoothed P/E ratio (CAPE-10 above) and compare it to the 10-year average of interest rates going back to 1900, the valuation to interest rate argument fails. As noted above, historical valuation measures have been dismissed for a variety of reasons from Central Bank interventions to the rise of automation. However, while earnings can be manipulated through a variety of measures like share buybacks, accounting gimmickry, and wage suppression, “sales,” or “revenue,” which occurs at the top-line of the income statement is much harder to “fudge.” Not surprisingly, the higher the level of price-to-sales, the lower the forward returns have been. You may also want to notice the current price-to-sales is now the highest level in history as well. 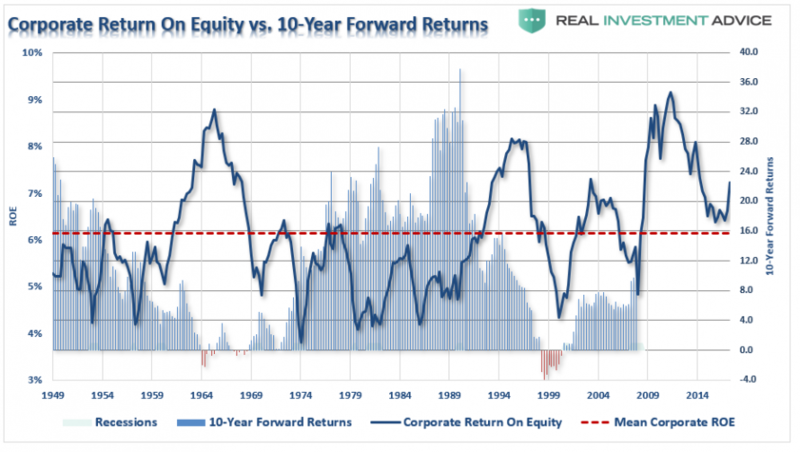 Corporate return on equity (ROE) sends the same message. Even Warren Buffett’s favorite indicator, market cap to GDP, clearly suggests that investments made today will have a rather lackluster return over the next decade. Even when we invert the P/E ratio, and look at earnings/price, or more commonly known as the “earnings yield,” the message remains the same. No matter, how many valuation measures you wish to use, there is no measure which currently suggests valuations are “cheap” enough to provide investors with sufficiently high enough returns over the next decade to meet their investment goals. Let me be clear, I am not suggesting the next “financial crisis” is just around the next corner. 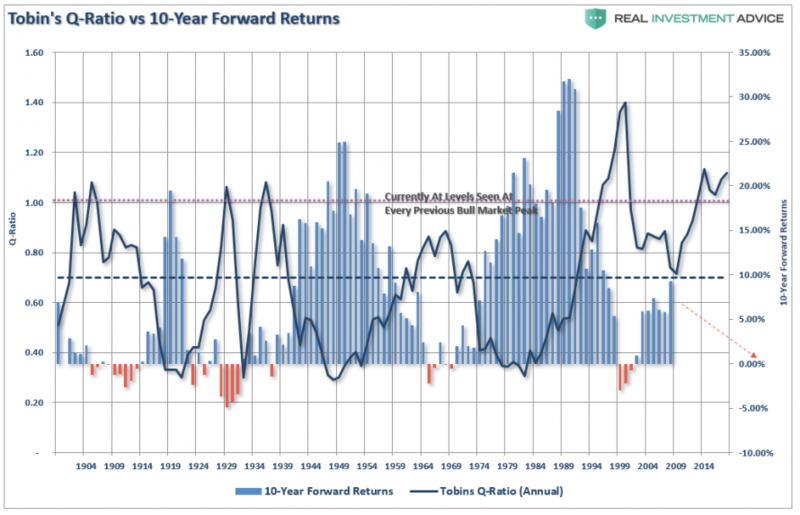 I am simply suggesting that based on a variety of measures, forward returns will be relatively low as compared to what has been witnessed over the last decade. This is particularly the case as the Fed, and Central Banks globally, begin to extract themselves from their long cycle of interventions. As stated above, this does not mean that markets will just produce single-digit rates of return each year for the next decade. The reality is there will be some great years to be invested over that period, unfortunately, like in the past, the bulk of those years will be spent making up the losses from the coming recession and market correction. That is the nature of investing in the markets. There will be fantastic bull market runs as we have witnessed over the last decade, but in order for you to experience the up, you will have to deal with the eventual down. 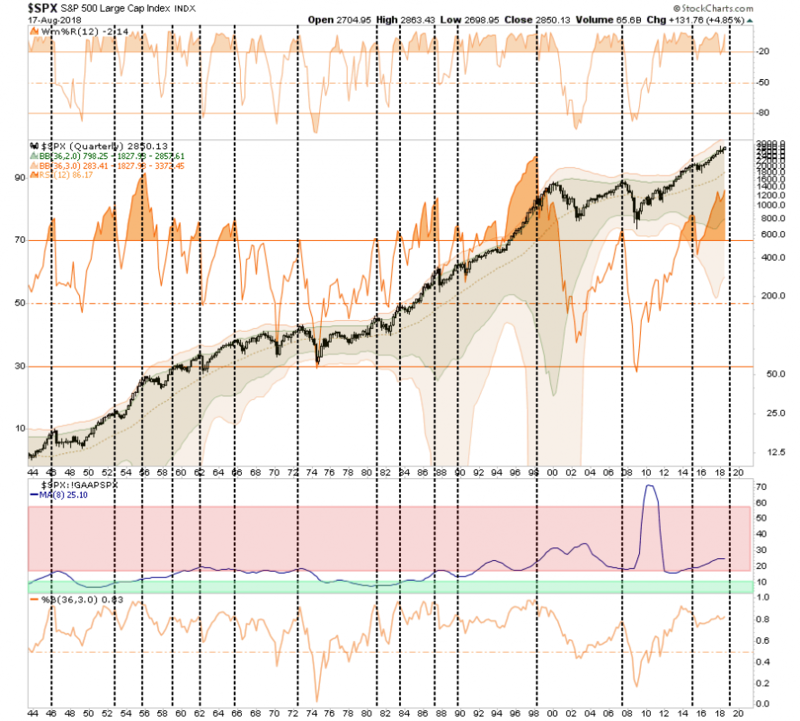 It is just part of the full-market cycle which encompass every economic and business cycle. Despite the hopes of many, market and economic cycles have not been repealed. Yes, they can surely be delayed and extended by artificial interventions, but they can not be stalled indefinitely. How you choose to handle the second-half of the full-market cycle is entirely up to you. However, “this time is not different,” and in the end, many investors will once again be reminded of this simple fact. Unfortunately, those reminders tend to come in the most brutal of manners.